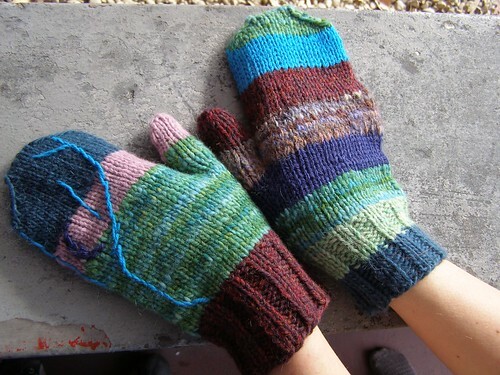 i’ve been trying to conjure myself up a pair of mitts for months now and haven’t succeeded. maybe it will be my turn next because i love how these fit the hands. christa is planning to make either a cord to go through her coat or little loops to clip them onto something. that makes me smile. Those are so pretty- if I wore those I’d have my arms outstretched constantly to look at them :-} I’m really looking forward to your book’s release! Hopefully the cord or loops will keep these with me for a long time! I’ll send you pics of me with my arms outstretched, ’cause I’ll totally be checking out my mittens all the time, too! I love these mittens. The colors are so pretty, and go so well together!